The 82nd Aviation Memorial was relocated when 82nd CAB moved from its previous Ardennes Street unit areas to the new Brigade complex on Longstreet Road. 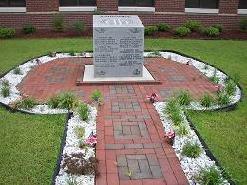 The 82nd AA raised funds to pay for the relocation and update of the Memorial. The Memorial now occupies a place of honor in front of the new Brigade Dining Facility. 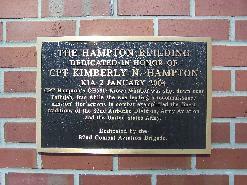 The 1-17th Cavalry Headquarters building was dedicated in honor of Captain Kimberly Hampton. Captain Hampton was the Troop D Commander in January 2004 when she perished from wounds sustained when her OH-58D Kiowa Warrior was shot down while conducting combat operations near Fallujah, Iraq. The Association provided support to the dedication including funds for the memorial plaques mounted on the building. The 82nd AA provided support for 82nd CAB dedications of additional facilities in honor of our fallen. Five additional dedications of buildings were completed during All American Week in May, 2008. With the deactivation of 18th AVN BDE, the 82nd CAB assumed responsibility to maintain the XVIIIth ABN Corps Aviation Memorial on Simmons Army Airfield. The 82nd AA intends to support efforts to renovate and update the site so that it serves as a fitting memorial for all Aviation Soldiers who made the ultimate sacrifice while assigned to XVIIIth ABN Corps units. The 82nd AA will annually recognize the Aviation NCOs and Soldiers of the Year selected by the 82nd CAB and subordinate units. The Association is proposing a program to recognize the Brigade's Aviators designated as Pilot-in-Command.